Rachel Watts has just moved to Melbourne from the country, but the city is the last place she wants to be. James Mycroft is her neighbour, an intriguingly troubled seventeen year old who's also a genius with a passion for forensics. Despite her misgivings, Rachel finds herself unable to resist Mycroft when he wants her help investigating a murder. He's even harder to resist when he's up close and personal, and on the hunt for a cold-blooded killer. It's been four months since the Watts family farm foreclosed, and Rachel and her family have been forced to relocate to Melbourne. Since moving, she and neighbour James Mycroft have been inseparable. Best friends, she is the country girl stifled by uptight city living, with Mycroft being her bright and eccentric offsider. But when the two teens discover a murder scene outside the Melbourne Zoo after dark, Mycroft's forensic obsession takes over. The police assume the murder was nothing more than a sport killing of the homeless man who is only known as Homeless Dave. But with his trusted canine friend missing, Mycroft believes that his companion may just hold the key to solving the murder. 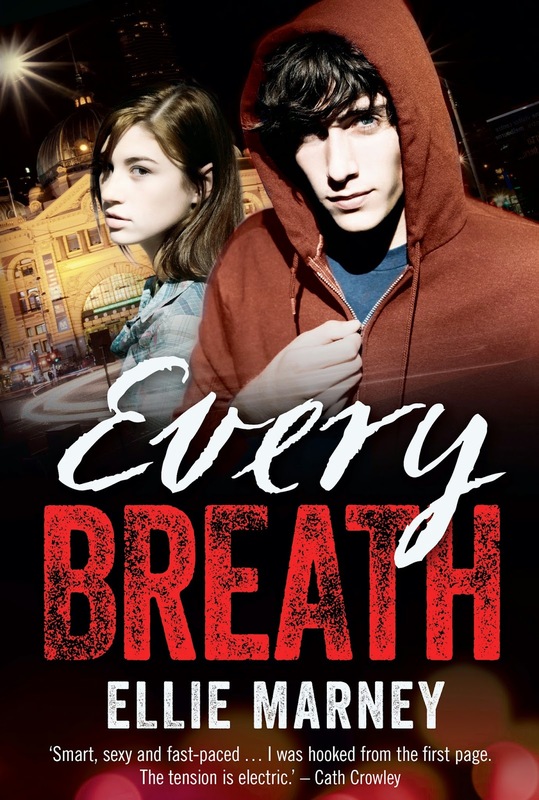 Every Breath is a phenomenal thriller from a Brilliant Australian author in Ellie Marney. It follows the story of Watts and Mycroft, who are on a strictly last name basis. Both dynamic characters in their own right, but share an intense attraction. He said if Sherlock had Watson, it was only fair that Mycroft should have Watts. Mycroft is a young man without supervision, living in a run down, ramshackle house with his absent aunt. His bedroom housing a makeshift laboratory, and follows his passion of forensics which entertain his inquisitive mind. He's charming yet dysfunctional, and doesn't adhere well to the classroom. Watts is the country girl stuck in the city, and is expected to provide a positive influence in Mycroft's life. Something her parents don't approve of. But Mycroft isn't just a troubled young man, he has a bright, brilliant mind and struggles with grief each day. I absolutely adored Mycroft and Watts, as individuals and as an incredible duo. The two teens have befriended a homeless man and his dog Poodle, who reside in the parklands surrounding the Royal Melbourne Zoo. But when they discover Homeless Dave has been brutally killed, they soon realise the police aren't interested in finding the assailant and Mycroft takes it upon himself to seek justice for Dave. What ensues is a grim and heartbreaking adventure, which will leave you on the edge of your seat. Ellie Marney is a natural storyteller, creating realistic, flawed characters that will adhere themselves to readers. I simply adored the slow burning romance, the intensity of the attraction between Mycroft and Watts only added to the suspense. It was simplistic, beautifully written and cemented Ellie Marney as an instant favourite on my shelves. I've had this on my shelf for ages and have only heard great things about the book. I love the dynamic the characters share with each other and how real they seem. And brownie points for it being set in Melbourne! So glad to hear you enjoyed it Kelly, I'm excited to pick it up soon! It was absolutely brilliant Joy. I'm kicking myself that it took me so long to get around to reading it. Both Mycroft and Watts are both phenomenal characters and the intensity! I can't wait to see what you think of it. So glad you enjoyed this. I've had it on my TBR shelf since it released but recently I've really been itching to read it. It might also have to do with the fact I'm now a fan of the BBC show. Also, I do love a good thriller and it's always great to support Aussie authors. Must read this soon! I must admit, I've never seen the show, but love a good mystery and this is one of the best I've read. The banter between the characters is just so uniquely Australian too and I think endeared them to me even more. Definitely pick this one up soon, you won't be disappointed. READ IT. Don't make me camp out on your blog and force you. You'll love it, I can almost guarantee it. Mycroft will give Morpheus a run for his money, you like the intelligent ones that brood and add mystery to a storyline. You won't be able to help it, Mycroft is your type of fictional guy. It's utterly brilliant Eugenia, you'll absolutely love this one. The characters, the storyline, the writing! It's all incredible! Ahh, so the Sherlock parallel was intentional. Good. For a minute there I was like 'uhm . . . what?' LOL. I LOVE ME A SLOW-BURN ROMANCE. And I also like that this isn't JUST a romance, but a mystery and a thriller too. Yes please! It certainly was and even not being a Sherlock fan, I absolutely loved this one. The romance is a friends to boyfriend / girlfriend, but it's an intense and slow burning one that's incredibly sweet even in the midst of a murder investigation. You'll adore this one Allie. It totally is. I always worry when starting a book that has so much hype attached to it, but not only did it live up to it, but it really exceeded my expectations even. I have Every Word sitting on my shelf already. I hear it whispering in the night read me, read me. I'm going to pick it up later this month so I'm caught up when the next in the series is released. I wish I had of read this one sooner. Mine was sitting on my shelves for quite a while too. It was a much hyped release and usually they tend to let me down a little. But gosh, it was brilliant. Totally exceeded my expectations. Pick this one up soon, you won't be disappointed. I just Googled the cover (I've read it but read the original cover edition) and it's her. Wow. She's been busy. First she solves a murder, then she goes and kills herself, but not before making a tap with all her grievances. We've probably just confused everyone now. I'm planning on waiting a little while longer before reading it now. Just a few weeks. It'll be hard, but then I figure the waiting time until book three won't feel as long. It's one of those life decisions. To read, or not to read ASAP. This actually sounds so intriguing, and what makes it better is that it's from an Australian author AND the setting is in Melb. It's so rare to have something set right in our backyard, I will definitely have to check this out. It made me enjoy it all that more too Tracy. Both characters live in North Coburg, and it mentions Brunswick, Fitzroy and Parkville around the Zoo as well. I have no doubt you'll love this one, can't wait to see what you think of it. WOOOO! I'm thrilled you liked this one! Seriously, these books are fantastic! And I just love that the author is Aussie and that's set in Australia, too -- that just makes it doubly as awesome. I also thought that the second book was even BETTER than the first one. :) I am so looking forwards to the third. And she's so incredibly lovely too isn't she. It makes this an even more incredible read! Every Word is even better? I can't wait. This one has been one of my most surprising reads this year actually. I knew I'd like it, but I absolutely adored it. I can't wait for book three either Kara. I don't think we have too long to wait either. Have only heard constant raves about this book and I can't wait to read it! I mean even Amie Kaufman herself recommended this series! I like how it's based on a dynamic duo with an adventure that pulls at the heart strings! Great review Kelly. It certainly did Jeann. You'll love this one, I have absolutely no doubt. It's simply brilliant. I can't wait to see what you think of it. Book three is being released in January, so make sure you read both Every Breath and Every Word by then, it's set to be epic. I absolutely loved it. I knew going by everyone's reviews that I'd enjoy it, but it blew my expectations out of the water. It was your review that pushed me to read it sooner than I had planned to, and I'm so glad I did. It was utterly brilliant wasn't it!